Founded in 1958 by Mr. Kirit Pathak, Patak’s is on a mission to help everyday people cook Indian inspired food at home. Patak’s takes great care sourcing and blending delicious spices inspired by 60-year-old family recipes, empowering home cooks to unlock the possibilities of Indian flavours and cuisine. Patak’s is the leader of the Indian category and offers a wide range of products (sauces, spice pastes, pappadums, chutneys and pickles) that can be found in supermarkets throughout Europe, North America, Australia and New Zealand. Consumer demand for easy solutions to cook from scratch is on the rise. 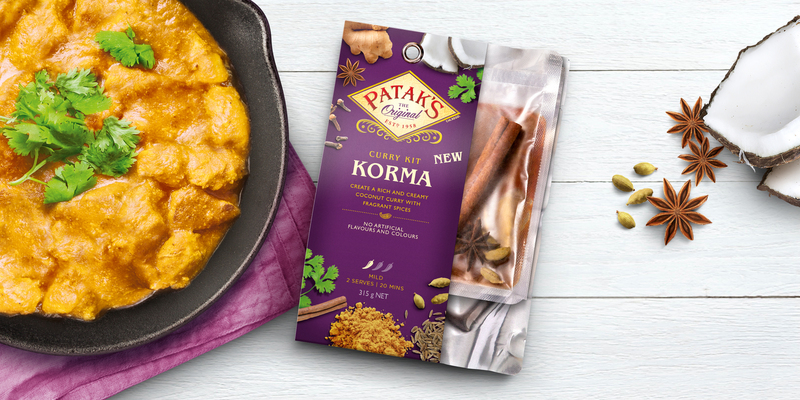 Patak’s was looking to launch a new 3-Step Curry Kit range into the ANZ market. 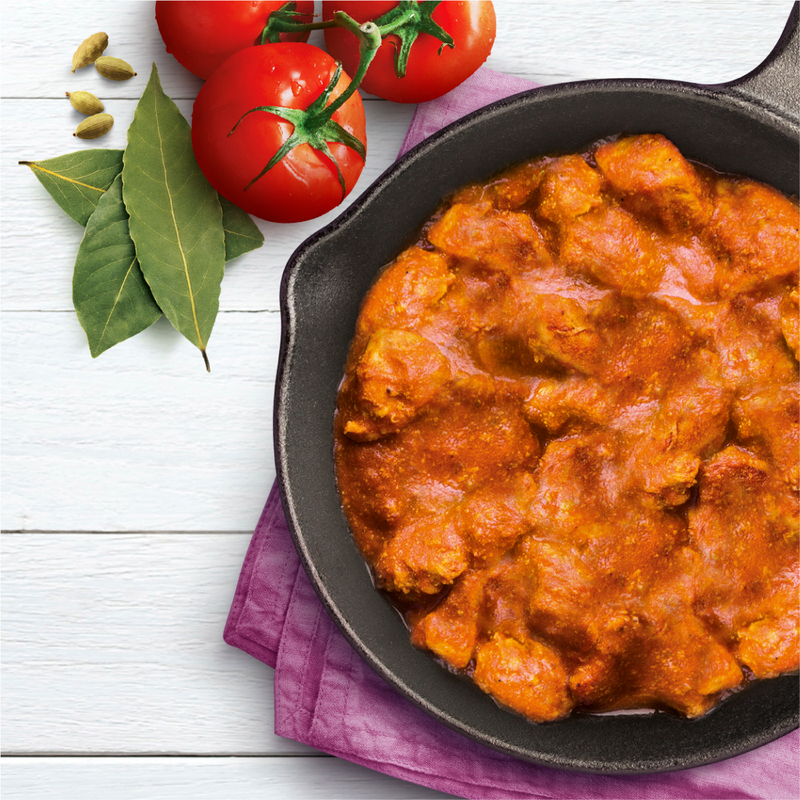 By following the 3 easy steps from Patak’s 3-step curry, consumers can create a delicious curry at home without the fear of getting it wrong. The presence of the spice paste, made with a blend of 8+ spices, is a key differentiator to competitors and true to Patak’s spice blending expertise. The packaging design needed to reflect Pataks’ expertise and quality in a simple, modern and mature way, as well communicate the simplicity of the 3-step cooking method without being overly functional. Given Pataks’ recognition in the market, it was important to retain the Pataks’ distinctive assetsthat consumers know well, such as the purple and the iconic diamond shape logo. Leveraging the consumer insights, we strategically focused on bringing to life the spices found in each of the Curry Kit variants. The front of pack design features beautiful ingredient imagery,while the inside of the sleeve dives deeper, telling the story of each spice. The strategy was also to create provenance and substance, which was brought to life with the map of India highlighting the origin region for each recipe. 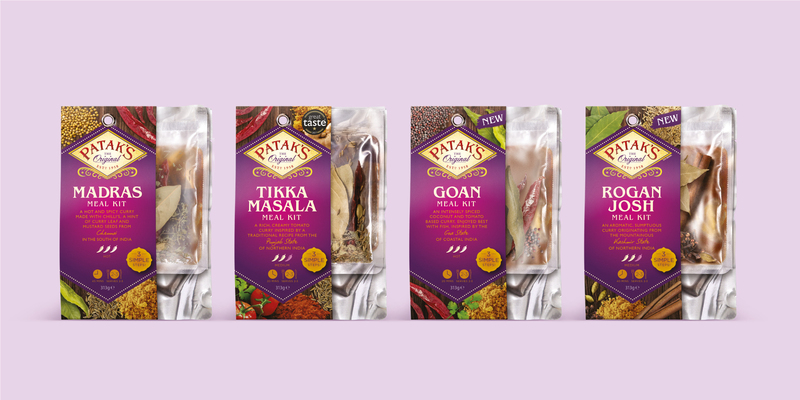 The design developed for Patak’s3-Step Curry Kits was extremely well received internally by the ANZ and global teams, leading the Patak’s UK team to engage Davidson to implement a similarversion of the design for the UK market. 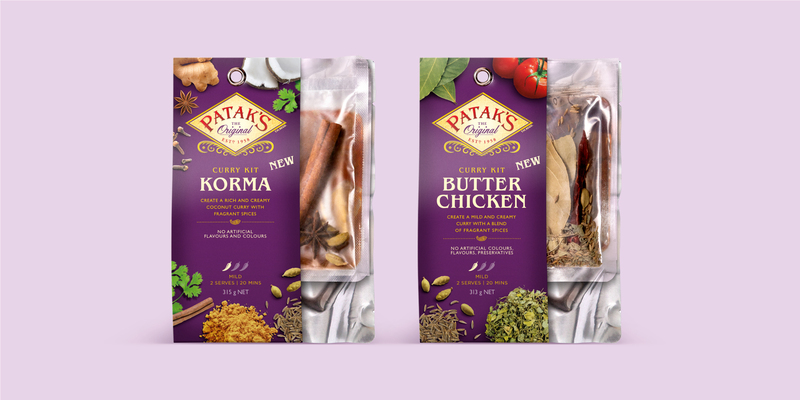 The Pataks 3-Step Curry Kits product has now launched across Australia, New Zealand and the United Kingdom.